The certificate was delivered by the Director of ANAC Juliano Alcântara Noman during a ceremony that was organized at the Brasília Air Force Base in order to be celebrated the Aviator Day and Brazilian Air Force Day. The ceremony was attended by the President of Brazil, Michel Temer, Minister of Defence, Joaquim Silva e Luna, and Brazilian Air Force (FAB) Commander, Lieutenant-Brigadier Nivaldo Rossato. The ANAC certificate is an important step before the receipt of military certification by the end of 2019 as expected, when the aircraft will reach the Final Operational Capability (FOC). “We are honoured and proud of the development of the KC-390, which will become the backbone of FAB’s transport aviation in the coming decades. 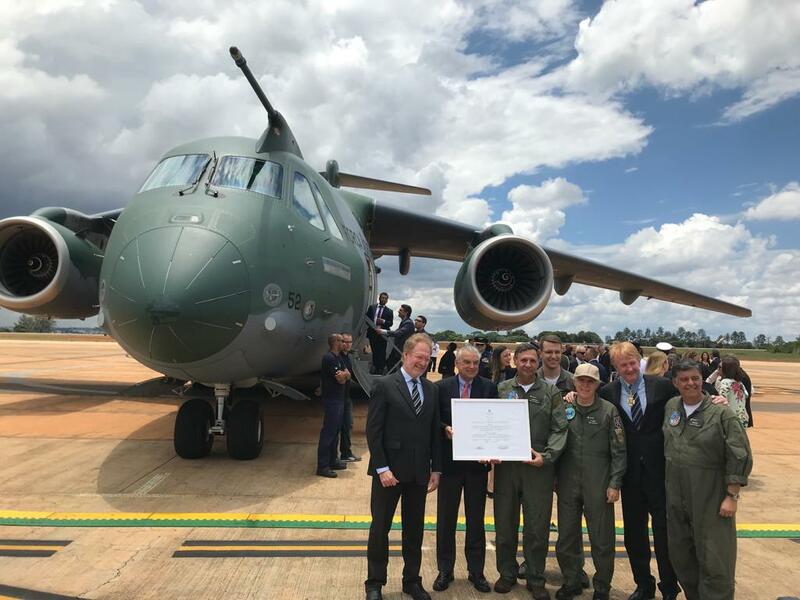 Extremely efficient and capable of fulfilling a wide range of missions, the KC-390 will certainly represent a leap in the operational capability of the Brazilian Air Force,” shared Jackson Schneider, the President and CEO of Embraer Defence and Security. The KC-390 of Embraer is a tactical transport aircraft developed to set new standards in its category while presenting the lowest life-cycle cost of the market. It can be used in various missions such as cargo and troop transport, troop and cargo air delivery, aerial refuelling, search and rescue and forest fire fighting. Embraer is a global company that designs, develops and manufactures aircraft and systems and provides customer support and services in the commercial and executive aviation, defence and security sectors. It was founded in 1969 and since then the company has delivered more than 8,000 aircraft. About every 10 seconds an aircraft manufactured by Embraer takes off somewhere in the world, transporting over 145 million passengers a year as reported by the company.